Cosmic communication: Act of transmitting, receiving, exchanging cosmic energy. THE LATTER-DAY PROGRAM is an age of expanded communication with God, with one’s own high Self, with brothers and sisters of higher dimensions and life expressions, with those of other kingdoms visible and invisible on and about the Earth, and with one another. Our planetary transition into the Aquarian Age may be likened unto a crash program in expanded communications awareness. Man of Earth is being taught rapidly to communicate truly and openly with himself, with his fellowman and with the Creative Life Force of the universe. We, as students of cosmic communication, are on the verge of graduating into a higher awareness of what true communication is. The training we are receiving, and will be receiving for the rest of this incarnation, will help us to become tried-and-true Christ communicators, sons of God who know how, what, where and when to communicate. Communication is an art that must be mastered by man of Earth in the coming New Age. Higher spiritual principles of communication or communion with Life Force are now being taught and demonstrated by many New Age groups in an effort to raise mankind and all life forms on this planet into the fourth dimension. Such groups of light workers, linked and united through the Christ vibration, help to open the lines of communication between the rapidly accelerating third dimensional or physical frequency of Earth and the higher cosmic forces of the celestial, the etheric and the astral planes. They also serve the all-important function of implanting positive and constructive patterns for all levels of life expression: spiritual, psychic, mental, emotional and physical. Mark-Age, through our five major divisions, is especially concerned with bringing forth only the highest of spiritual teachings and demonstrations of love in action. Through our educational functions, man of Earth is being informed of and taught the highest spiritual laws and understandings of cosmic communication. Everyone on the Earth, especially light workers, must come to understand and to demonstrate the nature, the powers and the talents of cosmic communication on all levels of life expression. Communicating with I Am Self. Spiritually speaking, one must learn how to unite with one’s own Christ Self within, and through this communion be linked directly with Spirit and the spiritual essence of all creations, which is the Creative Energy inherent in all things. Thus, with such lines of communication fully and permanently opened, one can truly serve all creation in the proper relationships and responsibilities intended for a son of the Father-Mother Creator. Communicate also with the soul. That is, one must consciously establish free-flowing lines of energy exchange with one’s own soul record of past experiences and functionings. Through gradually removing veils and blocks between the conscious and the subconscious or soul aspects of mind, one brings about the wedding or union or communion of the two. When the conscious and the subconscious are brought into harmony, direct and pure lines of communication can be established with the superconscious or the high Self. Communication of a psychic nature, such as telepathy or thought impression, is also to be learned, as it is a natural result of the unfoldments of the Elementary Spiritual Powers (ESP) inherent within each one. 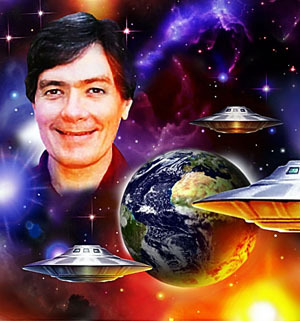 Through demonstrations of conscious telepathic channeling, such as through a pure channel like Nada-Yolanda (1925–2005), man of Earth is being given up-to-date news, information, education and guidance from those ascended masters in the higher planes who are helping to direct the hierarchal plan and program for Earth in these Latter Days. In her recent incarnation, Nada-Yolanda, as a member of the Karmic Board and a teacher of channels in this solar system, also served an important function in setting forth the spiritual discipline and the high standards required of the pure communications channel in the New Age. Communication involving one’s mental aspect is another area being evolved as we enter the New Age. For it is through intelligence and spiritual discernment that man understands and properly uses his intellectual and reasoning powers of mind for the benefit and the overall good of individual and collective evolution; not for detrimental purposes, that only add to negativity, rationalization, deception, delusion and illusion. It is through divine wisdom that the mental capacity can be put to use fully in affirming, decreeing and visualizing the New Age, thus replacing old error concepts with new images. Communication of the proper emotional nature must also be learned by all truth students. This energy-motivating part of our being must be put to proper use on the highest level possible so that what we image in the mental aspect can be pressed out into outer manifestation via the movement of the feeling nature within us. In this manner, divine ideas are given wings upon which to soar. We all know that true feelings of divine love are some of the highest generators of Creative Energy in motion, for it has been said many times that love is the key. Communication of a physical nature is also an important tool in the New Age, whether it comes from sophisticated machinery or from the power of the voice or touch. Since physical communication involves all five senses to one degree or another, man of Earth must learn how to use it for his highest good. Only through guidance from the high Self can man learn how to utilize wisely the physical energies and methods of communication. If it serves Spirit instead of mammon, if it serves the overall good of man’s evolution individually and collectively on the planet instead of simply sense gratification, only then may one know that such communication will bring higher spiritual understandings beneficial to man’s upliftment into fourth dimensional or Christ consciousness. In the present Latter-Day period and program, which is an age of cleansing, those instruments and methods of physical communication that do not bring forth good fruit must be so judged and cast into the fires of transmutation. Only the good may remain to aid mankind in his spiritual growth and development. 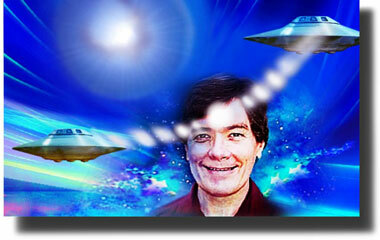 Cosmic communication concerns every aspect of man’s experience on the Earth planet. It involves understanding his true nature, heritage, powers and talents as a Christed being in complete harmony with all cosmic forces. It involves energy exchange at the highest levels. It involves balanced expression of all aspects of one’s being, for balance of spiritual, soul-psychic, mental, emotional and physical aspects leads to balanced communication. Man of Earth, Spirit has given the call to communicate. The New Age is upon us. Be a Christ communicator. Photos: (1) Phillel Mind’s Eye, courtesy of Hartmut Jager. 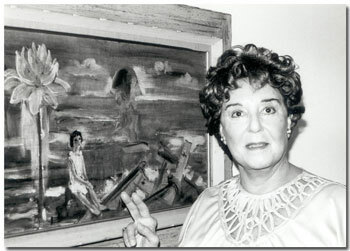 (2) Nada-Yolanda, 1993; in front of her soul portrait, The Carpenter’s Child, by Janet Kennedy; Mark-Age Archives. Wonderful, up-to-date and very useful information, Phillel. Thank you.